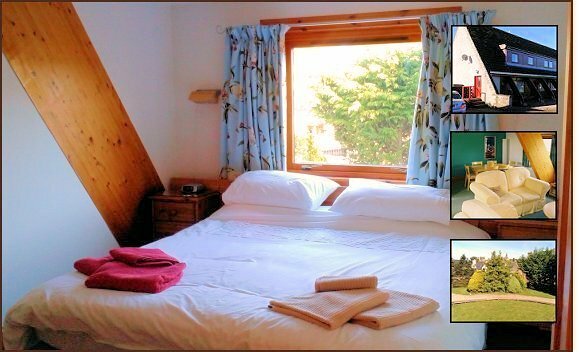 East Dune is a Scottish Tourist Board 4 Star first floor Apartment with garden access. The Apartment is designed to sleep 4 in two double bedrooms (one with en suite shower room). The Apartment is furnished and equipped to a high standard. East Dune is located within the historic town of Dornoch on the North East coast of Scotland in the county of Sutherland. From the Apartment it is a short walk to the Royal Dornoch Golf Club, the award winning safe sandy beach, shops, restaurants, Dornoch Cathedral and the facilities of Dornoch. Dornoch is a small highland town. It is conveniently placed for those visitors who wish to tour the beautiful scenery of North Scotland or for those who simply wish a pleasant relaxing break from the hustle of modern life. Dawn Knight, the proprietor of East Dune, and her husband Andrew Knight, will endeavour to help make your visit enjoyable. It is important that your visit is memorable. As a result, please do let us know if we can be of any assistance.